"Each glass piece is substantially rectangular and includes two opposing long sides extending in a height direction and two opposing short sides extending substantially in a width direction," the filing reads. It continues: "Each glass piece forms an identical circular arc when viewed from either of the two opposing short sides." The application notes that glass structures are often made of laminate that includes layers of glass and bonding materials, allowing them to meet structural requirements and support loads and forces of expected magnitudes. "For long spans of single, or monolithic glass panels, however, the conventional laminate structure may deflect for lack of sufficient support, and may be unsuited to withstand some loads or forces of great magnitude," Apple noted. These issues in building glass structures have prevented the creation of large buildings made simply of glass panels and supports. In the past, the maximum size of glass panels that could be used was limited. 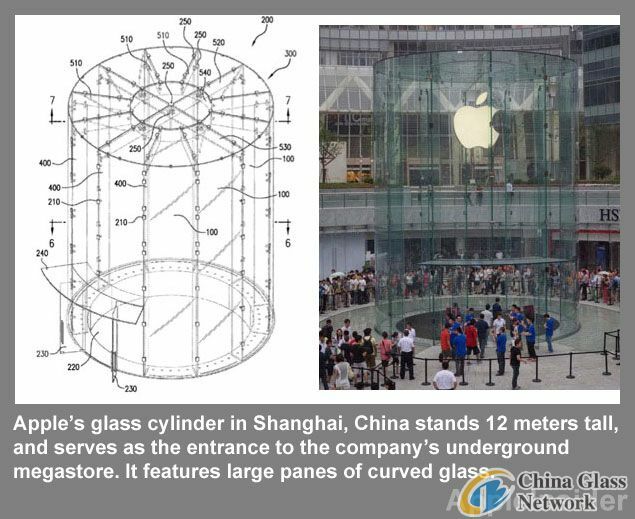 Cited in the latest patent application for the Shanghai store is a patent awarded to Apple, and partially credited to Jobs, in 2007 related to laminated glass structures. The latest application was first filed with the U.S. Patent and Trademark Office in May of 2011. It is created to David Andreini, Karl Backus, Jon F. Cooksey, Tim Eliassen, Scott David Hazard, Holger Krueger, Peter Lenk, James O'Callaghan, and Yutang Zhang.